Stoke City goalkeeper Asmir Begovic has said he is disappointed to have been left out of the Potters' historic run to the FA Cup final. Veteran keeper Thomas Sorensen has been preferred to Bosnia international Begovic throughout the competition. 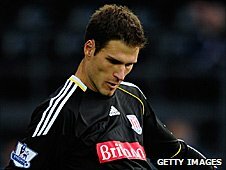 But Begovic, who has started the last 24 Premier League games, told BBC Radio Stoke that he understands the decision. "Of course I'm disappointed because I want to play in every game but I have no complaints," said the 23-year-old. "I understand the situation, Thomas is in for the Cup and he's done well in it. "The team has done well in it as well and that's the most important thing. "There are times when everybody has to jump in and I understand that. It's just the way it is and I understand it." Stoke reached the FA Cup final for the first time in their history with a 5-0 win over Bolton in the semi-final at Wembley on 17 April. Begovic is likely to remain in goal for the final five Premier League fixtures of the season, starting with the home game against Wolves on Tuesday. The Potters are currently on 39 points and Begovic is keen to secure safety as soon as possible. "It's important for the club," said the former Portsmouth keeper. "We want to stabilise ourselves in the Premier League and keep developing as a club."